Alcedo novaeguineae Hermann, 1783, New South Wales. Two subspecies. 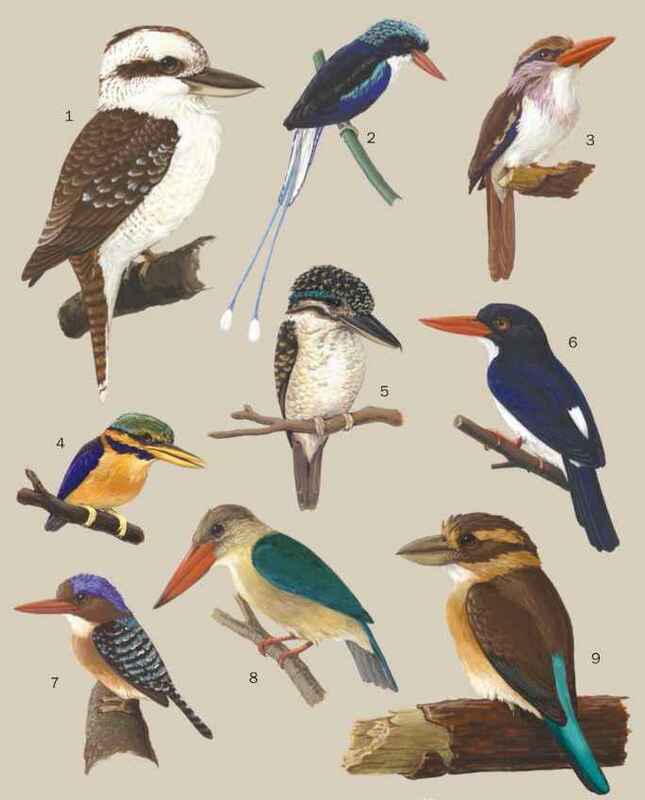 English: Kookaburra, jackass, brown, giant, or laughing kingfisher; French: Martin chasseur géant; German: Jägerliest; Spanish: Cucaburra Comin. 15-17 in (39-42 cm), 7-16 oz (190-465 g). Largest of the kingfishers, dark brown and white with blue rump and barred reddish tail. Has a dark mask through the eye. The bill is black above and horn (or horn-colored) below. Eastern Australia, introduced to southwest since 1897, also to Tasmania in 1905 and New Zealand since 1866. Group starts the day with a loud cackling laughing chorus, led by the pair and accompanied by their mature offspring. They spend long periods perched motionless and on the lookout for prey. Are generally sedentary and inactive. Group members roost together in dense foliage. Swoops down from low perch to pick up small animals as food, mainly arthropods, such as grasshoppers, beetles, and spiders. Also small vertebrates, such as snakes, lizards, mice, and small birds. Members of group usually feed separately. Monogamous pair breeds cooperatively with help of previous offspring. Nests are usually in natural cavity, less often excavated in termite nests or soft dead wood. Lays one to five eggs, usually two or three. Incubation period is 24-29 days, mainly by female but assisted by the group. Nestling period is 32-40 days; chicks are fed by whole group. Not threatened. Widespread and common, the species even benefits from most human developments of bush clearance and gardens. The only kingfisher to have its range extended by human introductions.